Robin Fulton Macpherson was known for a long time as Robin Fulton, a poet of chilly distinction in The Spaces Between the Stones (1971), The Man with the Surbahar (1971) and Tree-Lines (1974); as a sharply discerning critic in the book Contemporary Scottish Poetry (1974) and the essays collected in The Way the Words Are Taken (1989); and as the self-effacing, carefully discerning editor of the periodical Lines Review (1967–1976) and the selected and collected poems of Iain Crichton Smith (1983) and Robert Garioch (2004). This Collected Poems 1960–2010 establishes him as a poet of singular, lasting and memorable value beyond those earlier publications. New readers will welcome him, for his poems bring deep insights and hold in their words clarities, poignancies, keen edges and warm but discerning sympathies. These can be indicated at first by the accuracy with which many of them respond to, evoke, and elaborate upon, the works of other artists, particularly composers and sometimes painters. Among the painters, or rather, paintings, chosen as the subjects of distinctive poems, are William Crozier’s Edinburgh (from Salisbury Crags) (c. 1927) in the poem ‘A Simile for William Crozier’ and William McTaggart’s The Sailing of the Emigrant Ship (1895) and Will Maclean’s The Emigrant Ship (1992) in ‘Emigrant Ships’. The former describes the artist’s pouring sunshine into ‘the lowest wynd’ in the old town, while the city’s ‘top points, battlements and spires’ reach towards ‘the undersides of clouds’ in a December dawn, while in the latter, two depictions make a contrast: in the first, ‘emigrants disintegrate’ and in the second, a ‘cat’s cradle of pastel lines’ suggests the ‘crystalline miniature’ of its 1895 predecessor: ‘It’s light / of the kind that can’t turn a blind eye.’ The careful twist of judgement worked in there, a form of praise of the work of art, a recognition that the arts do more than merely commemorate, the poem’s way of showing how the paintings enter and express a moral value, is subtle, suggested, firm but tentative, sensitive to its own vulnerability. Both poems draw our attention quietly but inexorably to the work that all the arts do, of illuminating history, redeeming or regenerating our sense of human potential so often broken or wasted in exploitation, ruthless diminishment, cultural neglect or disdain. The poems draw attention to this with particular reference to particular artists or composers, so they never generalise crudely in blasé fashion and do not sentimentalise, but they open out, invite you to look beyond them with renewed appreciation. The book’s title is well-chosen: A Northern Habitat involves Scotland but also emphasises a broader, North European world, where winters kill and springs bring blessings of renewal but come at a cost. Summers are valued and autumns give no ground for melancholy self-indulgence. They are a long hinge in the seasons and bring pleasures of their own. There is less dramatic intervention in these actions than a deepening understanding that this is simply the way the world is, or this world is, in this northern territory, the music of what happens. These are the poems of a Scot whose life and sensual apprehension of the world has taken its own time and savoured its own locations without over-assertion or vanity, as his editorial work makes evident. Robin Fulton Macpherson was born on Arran in 1937 and has lived in Norway since the early 1970s, translating a number of major Scandinavian poets into English. He has seemed not so much an elusive as a marginal figure, doing fine work in a distinctive vein, his poems easily characterised by their lean, tensile bones and reluctance to say more, the steady poise of their language, their preference for indication rather than oratory. The resumption of his full name and the authority of a 501-page collected edition, however, prompts a full-scale reassessment of his work. Such a reassessment confirms the steely, self-defined and sharp focus some good readers understood and appreciated in the 1970s, and it more generously allows us to roam with him across decades and subjects, to appreciate his attentiveness undimmed, his restraint maintained as surely as his assessing eye has kept its cool sense of worth. His poems occupy a distinctive place in modern Scottish literature and modern poetry in English and warrant recognition and a wide readership. Perhaps the best way for me to register this is to pause on individual poems rather than to generalise further. There are samples from the earlier poems, from 1960 on, and suggestions already of what was to come. ‘In Memoriam Alberto Giacometti’ gives us the lean austerity of that man’s work, ‘existences […] massive, between slender definitions.’ And there is a lovely poem dedicated to Iain Crichton Smith, who mixes ‘pleasure with pure spirit’ and can ‘look through stones / to the other side […] in a hard light that knows how to touch gently.’ This is true of Crichton Smith but also true of Robin Fulton Macpherson. There is a continuing dialogue of references to other poets, so Hugh MacDiarmid’s line, ‘Hold a glass of pure water to the eye of the sun’ is answered by, ‘The sun will scorch your retina, a merciless razor’. But holding a glass of the Mekong or the Jordan will substitute a ‘cloudy element’ for daylight, and keep your vision safe. So all familiar screening is understood as safeguard, but it may also be refuge or evasion: ‘Even when switched off’ the TV screen ‘is never blank’. In other words, we see through other words than our own, but if we are careful enough, we can still see clearly. Thus, the poems in this book that take us to Assynt, Norman MacCaig’s favoured territory, offer different ways of seeing, of reading, of being in that landscape, from those MacCaig has made familiar to us. Ingmar Bergman, Hieronymus Bosch, Robert Henryson, Lagerkvist, Rachmaninov, and all their northern habitats, are magically brought into the conversation and the treasury of the collection. And other travels take us to Cambridge, Cornwall, Arran, Dedham Vale, and otherwheres – but as I read through the volume once, then again more slowly, and repeatedly, over the last few years, it was in the second section of the book, from page 241 on, poems from 1988 onwards, that the deepening and recurring themes and styles, subjects and tones, really take on a lasting and most impressive authority. The voices of the four strings are forest voices. Boles are nourished on the moist patience of decades. However, it would be misleading to suggest that these poems are full of abstractions. Abstractions are there but in every case connected to particularities. The range of imagery is relatively small – trees, forests, stones, seas, winters, sunlight, so forth – but nature is a sustaining repertoire, seasons bring difference, and the particulars, individual references to composers, artists, locations in time or geography, all anchor or ground the poems in contexts. This does not make them static. Quite the contrary. Imagine the sharpness of perception when you see a hare or a deer in the distance moving across a snow-covered landscape, or the clarity with which you hear a solitary bird’s song in an empty glen. That’s the sharpness and clarity with which movement happens and is experienced in these poems. Imagine a mind that has inhabited the northern European world and learned its arts and history, across the century, past two world wars and further back, and that knows the languages of the North, has translated them into English, that possesses the restraint of the stoic and the sensual apprehension of anyone sensitised to what ice is, and you have an idea of what Robin Fulton Macpherson is offering us here. It is a generously-made, well-printed book, care taken over typeface, layout, space and feel. Even the sharp, one-stroke (non-curly) apostrophes seem right, more like icicle edges than curving leaves. Edited, as the bibliographical information tells us, by Mariela Griffor, Travis Denton and the author, designed and typeset by HSDesigns, with a strong cover image of a seashore landscape, distant mountains, houses in the middle ground, trees beginning to grow in the foreground, by Dorothy Stirling, the product is a paradox, both austere and bountiful. This is a book I have returned to many times already and I will continue to do so. One of its most rewarding and pleasing aspects is Scotland’s place within it. Not as the privileged country of sentimentalised national distinction, though distinctive places appear again and again, nor as the scorned or inadequate location of such disappointments and frustrations as might sometimes seem apt, but rather as one of those nations among this northern habitat, mapped by personal history and memory, by family and relations, and by a word of connection (rather than MacCaig’s ‘world of difference’), with such connections made through the arts, through landscapes and through other people. Demographics and the politics of population centres are not priorities here. The essential mode of the poems is solitary observation finding forms of tuning in, of witnessing, accurate seeing; the essential motive, appreciation, savouring without indulgence, which is to say, ultimately, love. Corrective to the fashions of the publishing industry and prizewinning competitors, this is a major collection without neon or fanfare. It needs neither. It needs good readers, and will repay. 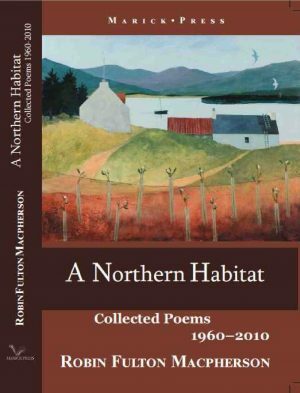 A Northern Habitat: Collected Poems 1960-2010 is published by Marick Press, 2013. Alan Riach is the Professor of Scottish Literature at Glasgow University and was President of the Association for Scottish Literary Studies, 2006-2010. He has published extensively on Hugh MacDiarmid, and on the poetry of modern Scotland more generally. He is the author of six books of poems, most recently The Winter Book (Luath, 2017).